The most asked questions I receive from bloggers are when to start sponsorships, how to go about it, and how to successfully maintain them. I am going to answer those questions today in hopes that it will provide some direction for you. When is a good time to start sponsorships on your blog? I love blogging and the creative outlet it has been for me. If I didn't love it, I wouldn't be doing it. I would most likely be taking on more freelance projects or forms of work that actually pay per hour. That being said, if it wasn't for sponsorships, I would not be able to run this blog. I get to continue devoting time to it because thankfully there is compensation for the time put into it. How did I go about starting? I knew early on that if I wanted to continue blogging well, I would need to start sponsorships. I focused on building a strong foundation of content and growing the blog naturally. 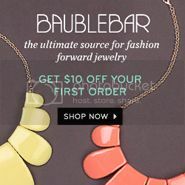 When I felt I had something to offer sponsors, I started accepting advertisements with a simple blog post announcement. I knew I had waited the right amount of time (1200+ GFC readers and subscribers, active engagement, brand identity, and consistent theme content) because I had an immediate reaction of sign ups. I also swapped a few ads with other bloggers with similar readership numbers to demonstrate how the ads are displayed. This is a great way to start! How many readers do I need to start sponsorships? I noticed some bloggers started sponsorships with fewer than 500 readers, and others waited till they hit 2000. Well folks, its not about visual numbers. Put yourself in the shoes of an advertiser. If I were looking to advertise on your blog, I would want to know how many readers visit your page daily, how your readers respond to your content, and how active and engaged your facebook page, pinterest, or twitter accounts are (aka: how engaged are people to your brand), and how visual and clean the ads are displayed on your blog. These are elements that let me know you and the brand of your blog are trusted by readers and that they are more likely to trust and engage in your advertisers. Make sense? Let me know if I lost you yet. Ultimately, even if you have 5000 gfc followers but your blog ads aren't user friendly and your readers aren't engaged, I would rather advertise with the blogger with less readers who meets the above requirements. When in doubt, wait a little longer. Oh the infamous question....and the toughest to determine. Its much better to start strong and charge accurately than to sell your ad spaces cheap to fill the space quick. If you are selling ad space for $5 - $10 a month, you are undervaluing your time and undervaluing your blog to the sponsor. I am guilty of this. I started the first month with $10 ads per month. The time that goes into blogging is way underestimated. Curating or creating a post can take way more time than meets the eye. If someone told me there ads were a $5 special this month, even though it is cheap, it tells me how they value their own space. I read some valuable advice recently from an IFB speaker that if three people in a row accept your prices than you are under-charging. It should feel like a little bit of a stretch for you, but your time and creativity are worth it. Like I mentioned previously, you can start testing your ad spaces by swapping with another blogger. It shows you are now offering advertising and how they would be displayed. What information do I give potential sponsors? Don't let the words media kit intimidate you. 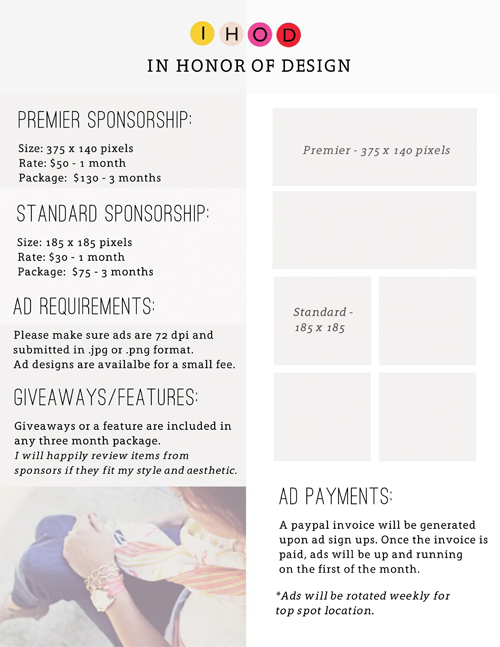 When I was first told I needed to create one for sponsors and potential work collaborations, it sounded daunting. I hope this can break it down and make it easier for you. 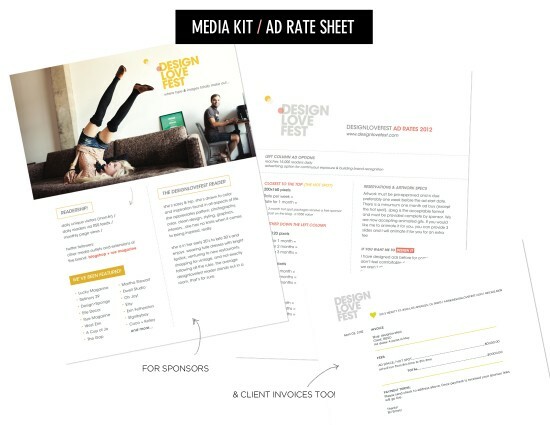 It is much more effective to have a media kit ready to send potential sponsors, rather than simply sending your rates and stats in an email. A media kit should reflect your brand and what your blog is about, as well as point out the benefits of working with you. A media kit for a blog can be as many pages as you want it to be. I am currently designing a media kit for a client that is one page with all info needed. My own media kit is three pages. I am going to be completely vulnerable here and share with you part of my own media kit. Why? Because I wish someone would have done this for me. There are so many great posts out there with how to build one, but I learn visually. I update my media kit on a monthly basis, and display the stats page on my sponsor page in the tab bar above. I am okay with sharing my rates simply because the prices and stats are going to be updated soon. The great thing is, you are your own boss so get creative with what you can offer your sponsors! Don't be afraid to ask similar bloggers in your field for their media kits or what their rates are. They can say no, or they may be happy to help with info! 1) Logo or blog header at the top. Blog and brand identity is key. 2) Attractive colors or imagery are also a plus. Depending on what blog you are. 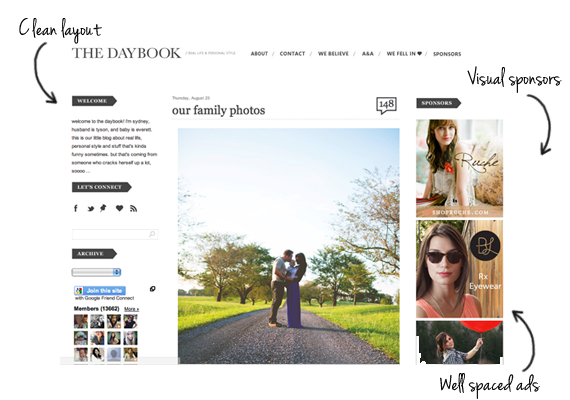 The images should reflect the content of what you blog about. 3) Statistics- like I mentioned in this blog boosters post, there are several ways of obtaining accurate and relevant statistic information for to deliver to potential sponsors. I would trust platforms that specialize in analytics over blogger stats. 4) Demographics - there are ways to measure demographics through analytics and facebook. You can also conduct a survey of readers so that your potential advertiser knows your target audience. 5) Testimonials - It doesn't hurt to throw in a few good quotes from past sponsors or collaborators (I need to do this) since it always helps to hear from someone's experience and gain you credibility. These are the main points to include, but you can also add additional background information or work history if you feel it will benefit. I highy reccomend you read Bri Emery's post on brand and media kits here. She offered this fantastic example of how congruent your pieces should look and feel. 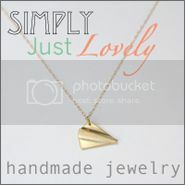 Design*Sponge also has a fantastic media kit How-To post. Do you approach sponsors or do they approach you? So far, I have been blessed to have a steady flow of inquiries and sign ups. However, if I come across a business that I particularly am smitten by and dream of working with, I will approach them. It doesn't hurt to send an email proposing why you want to work with them, and how you are a good fit for a collaboration. I would go outside your comfort zone at least once a month. Set a practical goal such as two emails per month. However, you should keep track of who you contact! That is all for now friends. PLEASE leave any questions you have in the comments section so I can email you directly or update the post! love that you are sharing this. your heart is so sweet. i hate how the blog world sometimes gets really catty and competitive and so we don't share how to have victories (i'm guilty)... sharing your success like this is the opposite and i love it! Invaluable advice here-- thank you SO much Anna!! Anna, this post is so great and so, so helpful! I cannot thank you enough for sharing this with us. Creating a media kit does sound really daunting, but you explained it all really well and made it accessible and do-able. Merci beaucoup, friend! 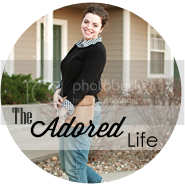 Great blog post Anna, I'll probably re-read it if someday I decide to start my own blog! I have a question regarding sponsorship: is it legal? I know everybody does it, but do you have to declare the money you earn with your blog in your taxes? I'm not familiar with the terminology, but I hope you understand my question! I don't mean that everybody is doing an "illegal thing", I just wonder how this works! Great post, Anna. You are so kind to share. I find it really helpful, thanks! This is so incredibly helpful! Thank you, thank you, thank you! Great post. Thanks for the insight! This was absolutely fantastic, Anna! Thank you!!! Excellent post and fabulous advice. Your advice is always appreciated. You all are sooo kind. Thank you so much for the awesome feedback! Very informative. Definitely saving this for later. Wonderful site! This is amazing. I've been too busy (or just plain lazy) to get on the media kit but you have inspired me! So informative. Thank you, thank yooouuuuuu. 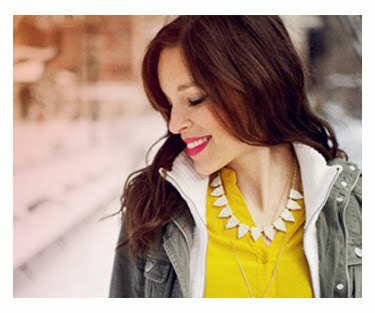 Can I ask how long you have been blogging for? It's been a year for me and I wonder sometimes if I need to re-evaluate and change something in order to make something of what I've got. This is awesome. I've had a few bloggers approach me about swapping ads and I'm totally game... all blogs want readers, right?!! Right now blogging is just a fun hobby, but in case I ever try to make it something more, this resource is perfect! Also, have you heard of passion fruit ads? I just started using them, and like the concept a lot. Even if it's just to import your own ads because their coding automatically rotates all the ads in a certain category, which is just so smart. Great advice Anna, lots of great information. Okay, I hope you don't regret writing this post and being so honest, or at least other bloggers don't attack you for lowering their master-ness. A little joke (not all of it), but I truly believe that great people love sharing and without even realizing they somehow start to live out of their ability to share and tutor other people. I am not saying you are trying to do this or this will be your future, maybe not at all, but I just love how far you have gone with being honest and sharing your experiences. Maybe we (the readers) have pushed you a little too far (Ha!) but I wish you enjoy putting your success out there as much as we enjoy your posts. Good job again! This was such an excellent post Anna! Actually this one along with the entire series, it's always daunting to know what to do next you know? It's nice to have a fellow blogger that I really enjoy following be so open and helpful with her readers. I have another quick question for you, (not sure if you've addressed it yet) and that's how to go about having guest bloggers. Do you approach bloggers or wait for them to approach you? Do they submit the content and pics to you and you pre-approve and upload or do they do it themselves? Just a general of how it works would be great if you had time. Thanks again! -JB. Fabulous post Anna! Love that you're educating & sharing insight. So generous & helpful to many I'm sure! Great info. Saving this for when the time is right. Thanks! I've been keeping this post on my 'to read' list all week. Waiting for the right moment. So glad I did. Lot's of great advice and I'm glad your overarching messages were so positive: don't rush and don't under value yourself. Thanks so much for sharing and for this great series. I hope to put it to good use on my blog. Many business which give different benefits by starting in best ways like there are many sponsors who can invest their money in business to give good start. Wow, such a great and informative post! thank you so much for sharing...I've saved it (yes, SAVED it not just bookmarked) for future when I look into doing sponsorships more seriously. Thank you for the candid and honest look at how you tackle this. 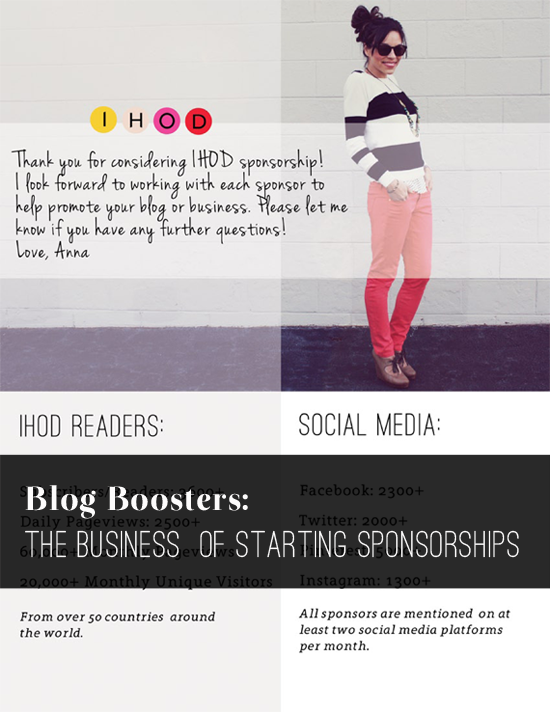 So happy that you sent me the links to your Blog Boosters Series, Anna!! I've enjoyed reading each of your posts on this subject and appreciate your honesty and encouragement for other bloggers to keep pursuing their passion! Thanks so much! Did you know that that you can earn cash by locking premium pages of your blog or website? To begin you need to open an account with AdscendMedia and embed their Content Locking tool.